Instant Pot Chicken Noodle Soup made from scratch and ready in just a few minutes. Delicious and packed full of noodles and chicken, this homemade Instant Pot recipe for chicken noodle soup will warm you up on a cold winter day. Or comfort you or a loved one when you’re fighting a cold. I know it’s an old wives tale but seriously nothing makes you feel better when you are fighting a cold than a big hot bowl of homemade chicken noodle soup. 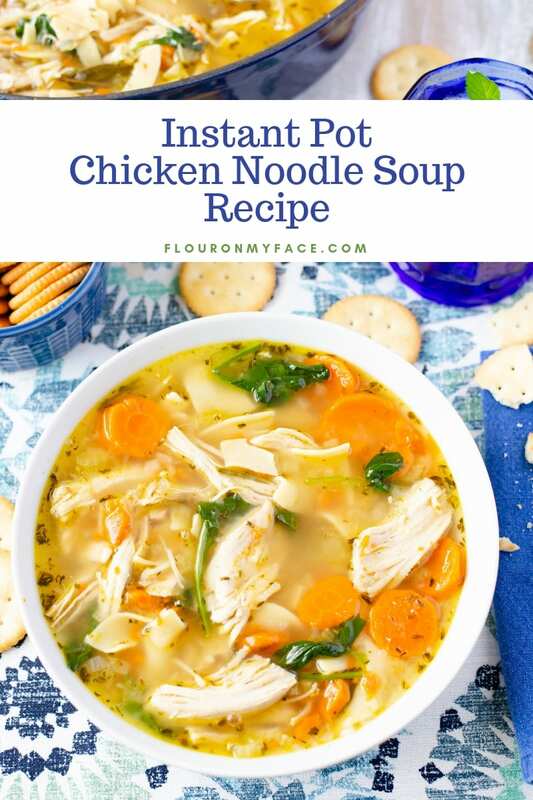 Now you can make homemade chicken noodle soup in about 30 minutes when you make it in the (affiliate link) Instant Pot. 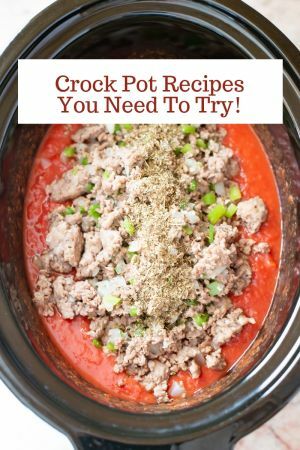 Instant Pot Recipes are fast and easy to make. Today to make this Instant Pot Chicken Noodle Soup recipe I am using boneless chicken breast and store-bought chicken broth. Using boneless chicken breast will cut out the step of removing the chicken meat from the bones and make this Instant Pot Chicken Noodle Soup recipe easier and faster to make. 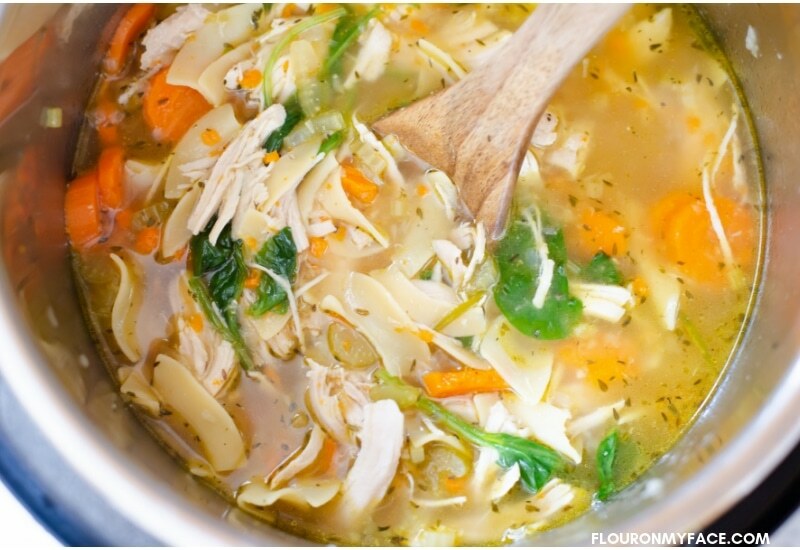 I like to use boneless chicken breast to make this Instant Pot Chicken Noodle Soup recipe. 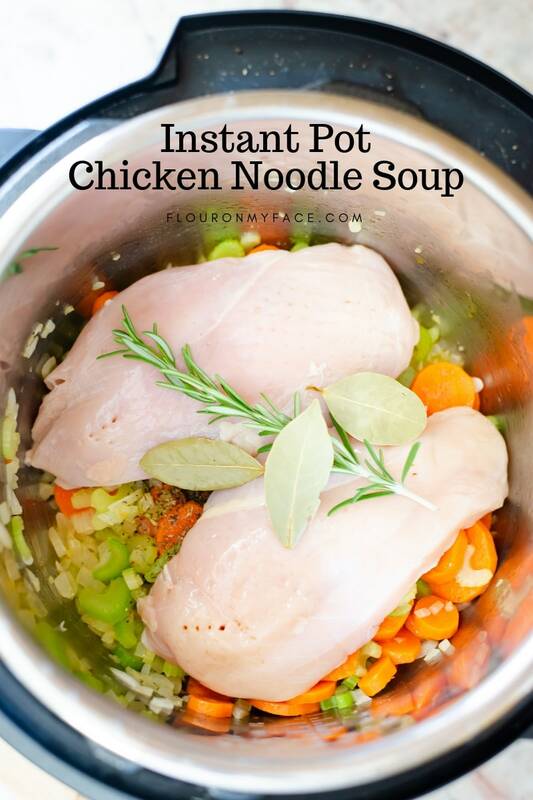 Most all my recipes including this Instant Pot Chicken Noodle Soup recipe uses boneless chicken breasts because using boneless chicken makes it easier. The best Instant Pot chicken noodle soup is made with homemade chicken broth. 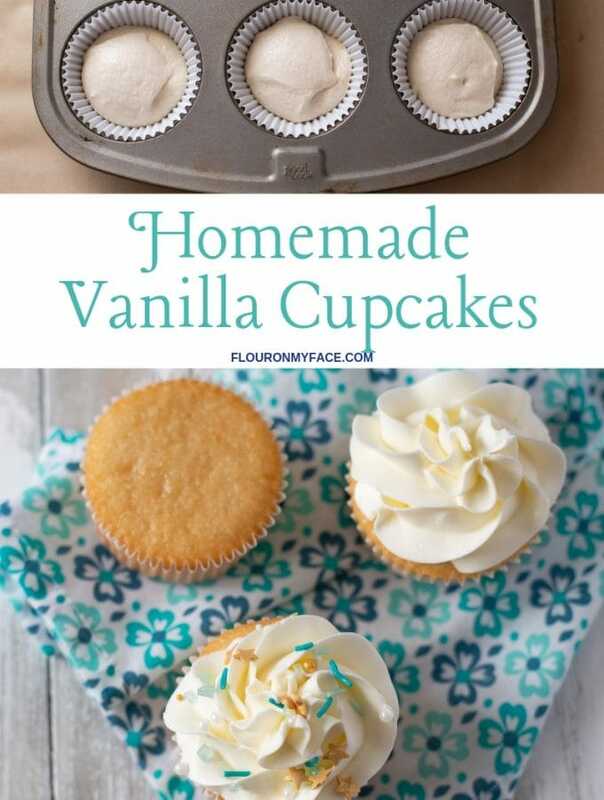 Which I love to make, but didn’t have any on hand today. 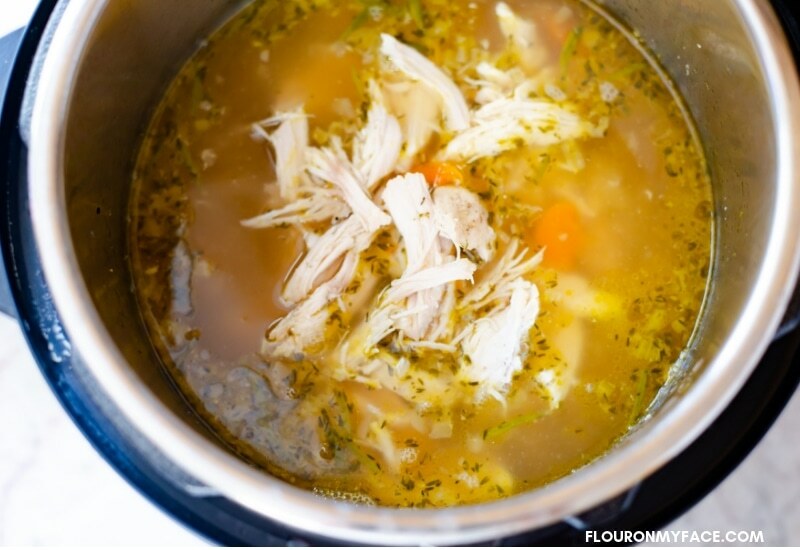 If you want to make your own homemade chicken broth in the Instant Pot and you already know how to make it yourself you can of course use the homemade broth. 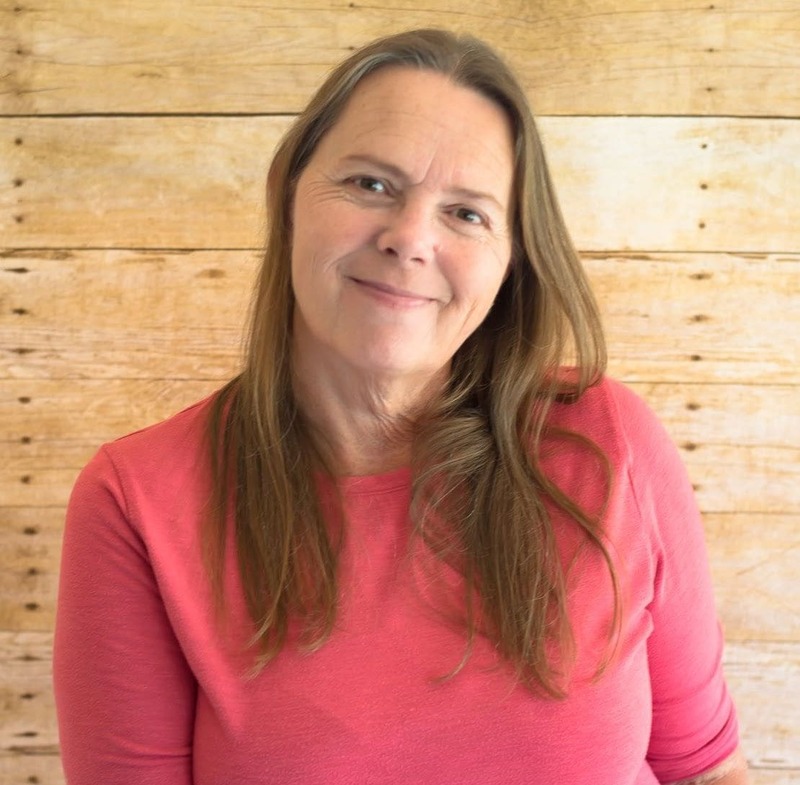 If you don’t know how to make homemade chicken broth I’ll be sharing how I make Instant Pot Chicken broth another day. 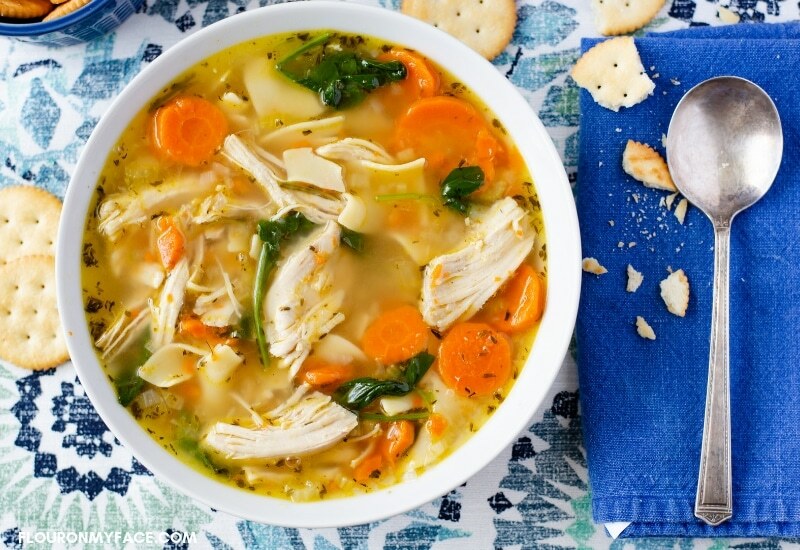 Instant Pot Chicken Noodle Soup starts out just like any homemade chicken noodle soup recipe with fresh ingredients like chicken meat, chicken broth, and fresh vegetables like celery, onion, and carrots. 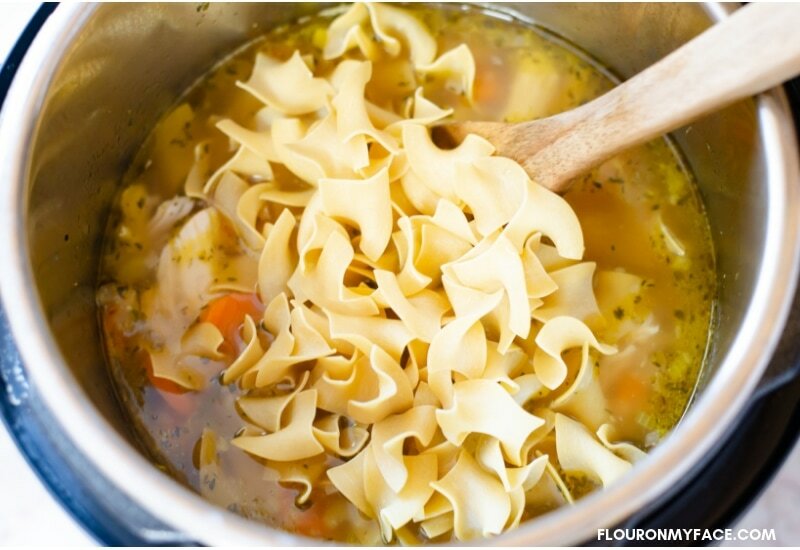 These are the basic chicken noodle soup ingredients. What makes homemade chicken noodle soup special is the herbs or spices you use to season the Instant Pot Chicken Noodle Soup. I have a few herbs and spices I like to use when I am making homemade soup. We’ll get to the homemade soup herbs and spices in a minute. Do you have to saute soup vegetables? Do you have to saute soup vegetables? 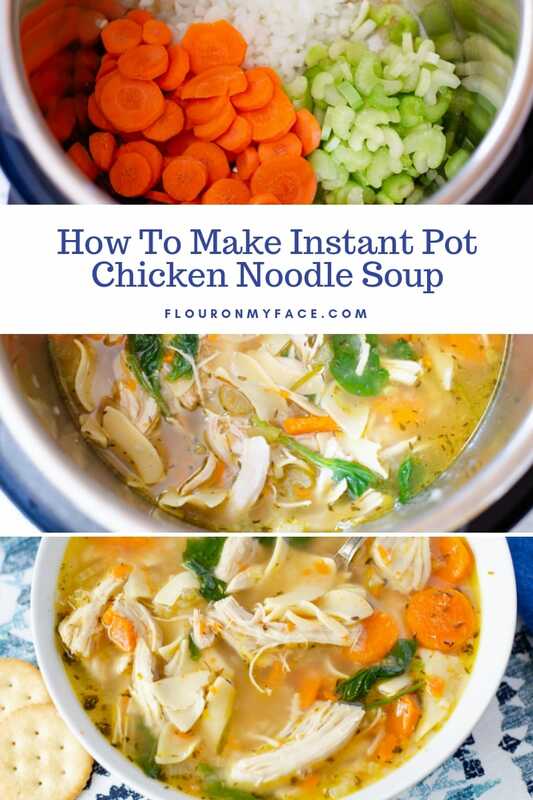 I like to saute my soup vegetables because it adds another layer of flavor to homemade soup recipes like this Instant Pot Chicken Noodle Soup recipe. 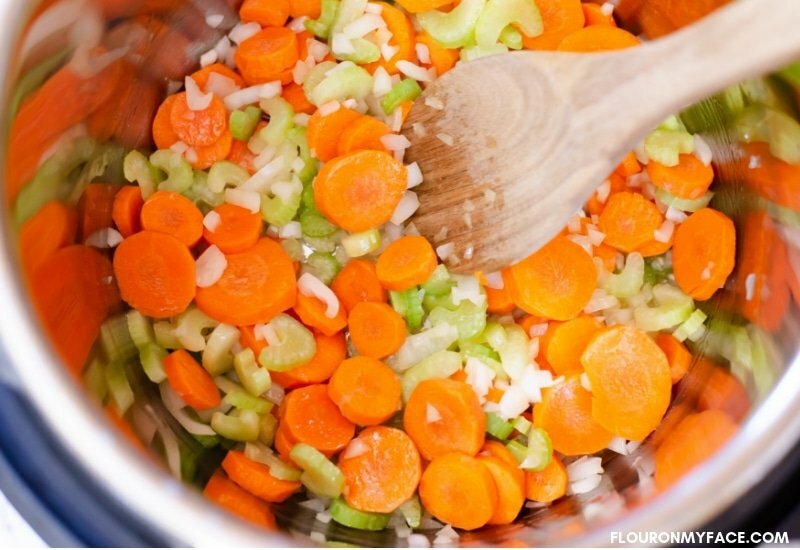 If you want to skip sauteing the soup vegetables you can. Your Instant Pot Chicken Noodle Soup will still taste very good. 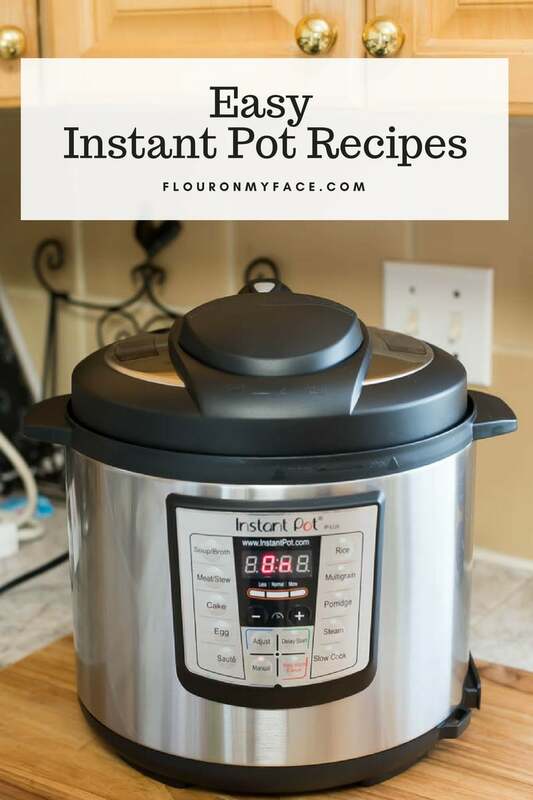 Since Instant Pot Chicken Noodle Soup or any other Instant Pot soup recipe you make is going to cook so much faster in the Instant Pot why skip sauteing the vegetables when it adds so much more flavor to your homemade soup? After you have sauteed the chicken noodle soup vegetables you will add the boneless chicken breast and remaining herbs and spices to the Instant Pot. I like to use three herbs and spices to season my chicken noodle soup recipe. 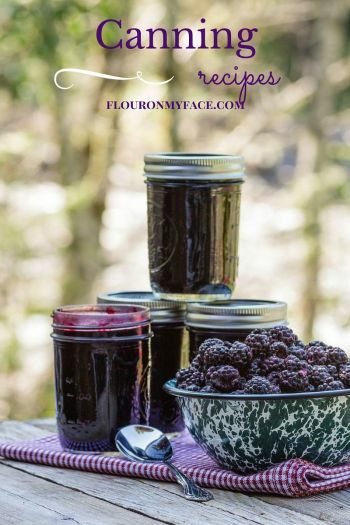 These three herbs are my favorite herbs to use when I am making homemade soup or stews. I prefer to use fresh rosemary and fresh thyme which I have growing in my herb container garden. My fresh thyme took a beating from the summer heat and on this day I didn’t have enough fresh thyme to use so I used dried thyme. Start adding these three herbs to your soup or stews and you will be amazed at how much more flavor your soups will have. 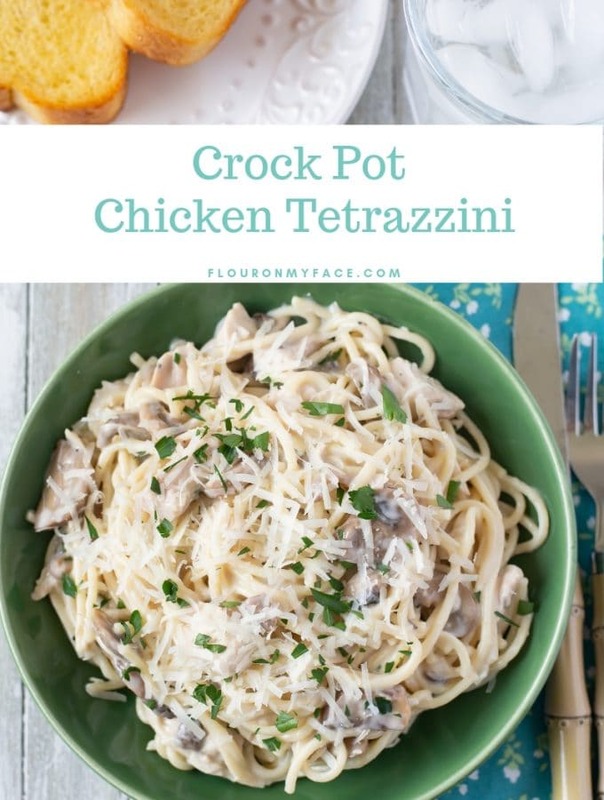 Once you have sauteed the vegetables, added the chicken and herbs to the instant pot and pour the chicken broth into the Instant Pot. Use a large spoon to mix the ingredients well. Check to make sure the rubber seal is properly in place on the inside of the instant pot lid then place the Instant Pot lid on, twist into place and make sure it has locked into place. Turn the Instant Pot valve to the sealing position and push the manual button. Adjust the pressure cooking time to 8 minutes. It will take about 15 minutes for the Instant Pot to reach full pressure and then it will begin pressure cooking. When the Instant Pot timer goes off notifying you that it has finished pressure cooking allow the pressure to naturally release for 8 minutes. Carefully, using a long-handled spoon like a wooden spoon push the valve to release and allow the trapped steam to release. Once the steam has completely released twist the lid off and carefully open the instant pot so the steam releases away from your face and body. 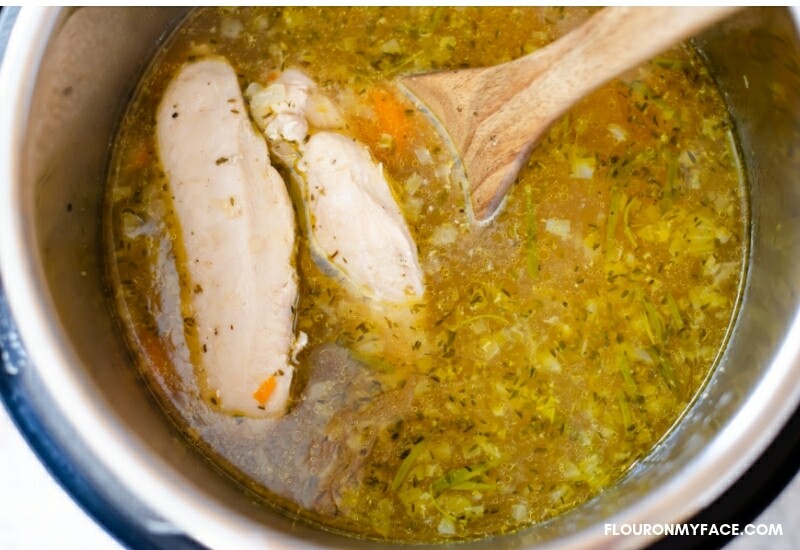 Remove the cooked chicken breast from the Instant Pot and place it in a bowl. Use two forks to pull the chicken meat apart into bite-size pieces. Return the shredded chicken meat to the Instant Pot and immediately stir the wide eggs noodles into the hot chicken broth. Place the lid back on the Instant Pot and allow the noodles to cook in the hot broth of the closed Instant Pot for about 5 to 10 minutes depending on how well you like your noodles cooked. I like to stir some fresh spinach leaves into my chicken soup recipes but you can skip this step if you don’t have any spinach on hand. Instant Pot Chicken Noodle Soup is a delicious hearty homemade chicken soup recipe that is perfect to serve during the cold winter months. Store-bought broth cuts out time when making homemade soup recipes. Noodles should be added to the Instant Pot Chicken Noodle Soup after the soup ingredients have pressure cooked. Noodles will turn to mush if cooked in the Instant Pot pressure cooker. Always carefully lift the Instant Pot lid away from your face and body when opening the Instant Pot after pressure cooking to avoid burns. 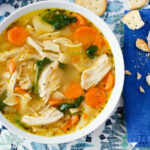 (affliate link) I used my 6-quart Instant Pot to make this chicken noodle soup recipe. 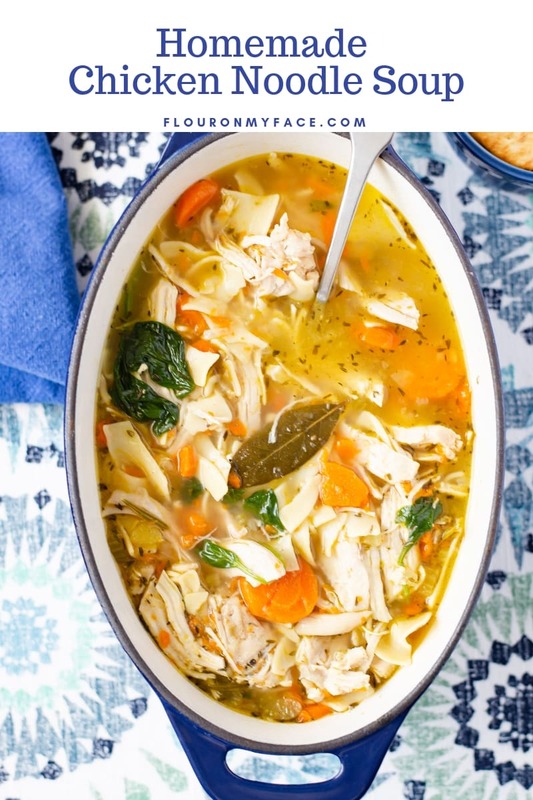 Instant Pot Chicken Noodle Soup is a hearty chicken soup recipe the family will love. Packed full of flavor Instant Pot Chicken Noodle Soup is going to become a family favorite during the cold winter months. Turn the Instant Pot on the saute setting and melt the butter. 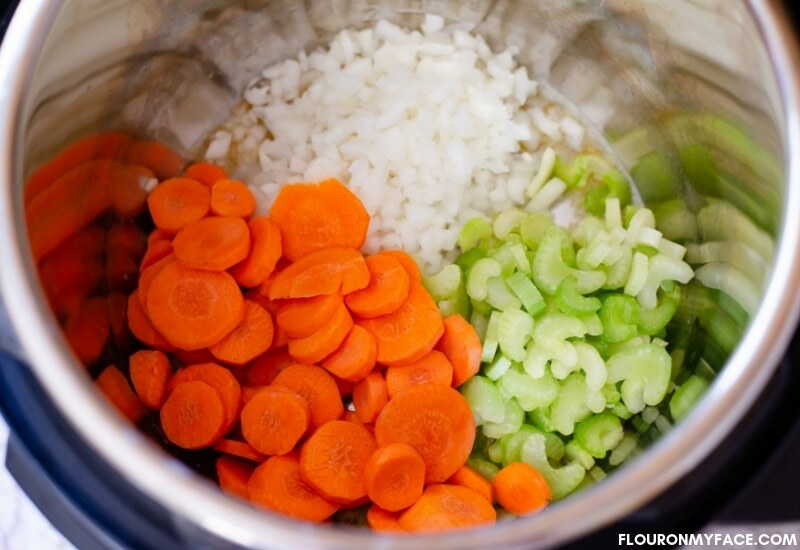 Add the sliced celery, diced onion, and sliced carrots to the Instant Pot. Saute for about 5 minutes or until the onion is starting to get translucent. Add the salt, ground pepper, and ground thyme and mix. Add the boneless chicken breasts, bay leaves and rosemary sprig to the Instant Pot. Pour the chicken broth in and mix to combine. Place the lid on the Instant Pot and make sure it is engaged properly. Set the valve to the sealing position. Press the manual button and set the pressure cooking time to 8 minutes. Once the Instant Pot has finished pressure cooking allow the pressure cooker to naturally release the steam for 8 minutes. Use the handle of a wooden spoon to push the valve to the venting position and allow the remaining steam to release. Carefully open the lid of the Instant Pot and lift it so the steam escapes away from your face to prevent a burn. Remove the pressure cooked chicken pieces from the Instant Pot and place them in a bowl. Use two forks to shred the pressure cooked chicken meat. Return the cooked chicken to the Instant Pot. Add 1 1/2 cups of extra wide egg noodles to the Instant Pot and mix to combine. Place the lid back on the Instant Pot and push the vent to the sealing position. Allow the Instant Pot to sit undisturbed for 12 minutes to cook the wide egg noodles. 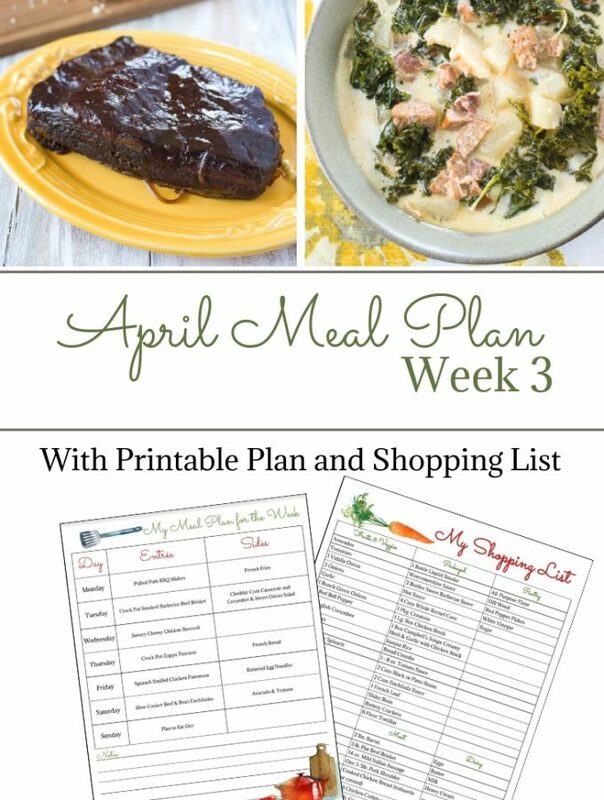 Because you love easy Instant Pot recipes as much as I do check out the rest of my Instant Pot recipes here.